Do you have an old bespoke suit you no longer wear because you’ve gained or lost a little weight, or the style of the suit looks a little dated? Or maybe you’ve just purchased an off-the-peg suit that is made from a great fabric but it’s not hanging on your body particularly well. Most of the time, these suits no longer see the light of day, or they never get worn as much as a new purchase should, because you never really feel comfortable wearing it. Thankfully, these issues can be addressed by some bespoke alterations by our master tailors. They can breathe new life into a much-loved suit from the past, or transform an ill-fitting $300 suit into one that looks like you’ve paid $1,000 for it. So, in this blog, we take a look at some the more common types of suit alterations we offer our clients. We also put the spotlight on a regular customer of ours who recently had a new suit altered. This example should hopefully show you the skill of our highly trained team and the difference they could make to a suit of yours that needs a bit of tender loving care. Hemming simply involves folding and sewing the bottom of each leg on a pair of pants. This is usually to make the pants shorter or finish them off if they’re a new pair of off-the-peg trousers that haven’t already been hemmed. But you can also lengthen trousers if there’s enough original material present. Where you decide to have your pants hemmed is entirely up to you. You may want the bottom of your pants to lightly kiss the top of your shoe when you’re standing still, creating very little or no creasing (also known as the break). Or you might want to flash the color of your socks as you walk, which has become increasingly popular in recent years. Whatever length you choose, it will help to create a stylish look that shows you care about your appearance. If you’ve got a great pair of pants you love but are now too roomy for you, don’t worry. We can easily take in (reduce) the waist of your pants so they fit you exquisitely and feel great. This type of alteration also usually involves adjusting the seat of your pants and potentially the crotch, due to excess fabric once the waistband is reduced. Something you may want to consider if you’re a guy with an athletic build is buying off-the-peg trousers that are too big on the waist but give you the room you need in the thigh area. We can then reduce the waist on these pants so all areas of your trousers feel super comfortable. When it comes to letting out (making bigger) the waist of a pair pants, it all depends whether there’s extra material to work with at the back centre seam of your pants. Typically, most quality dress pants do feature this excess material so they can potentially be let out at a future date. The best thing to do is to come into the HKT store with your pants to discuss exactly what you’re looking for. You may own some older pants that feel great but are just too baggy and look outdated. The great thing is we can precisely taper them so they begin to create a far more flattering silhouette that adds a touch of sophistication to your look. How much you have your pants tapered is completely up to you; although it’s important to think about your physique and where and when you’ll be wearing your trousers. If you’re unsure about what you want, our expert tailors can provide you with lots of helpful guidance. They’ll know exactly what needs to be done to create a comfortable pair of pants that also delivers the suave style you want. To pleat or not to pleat, that is the question. Or it often is when someone is buying a new pair of pants. The only problem is that sometimes mistakes are made. You might have bought or had some trousers made for you that feature pleats but now you want them to be flat fronted. Well, this issue isn’t a problem for our master tailors. They can carefully work their magic to convert some pleated pants into a pair of trousers that look like they’ve always been flat fronted. We’ve done this for customers time and time again, and they’ve always been astounded by the results we’ve achieved. This is the biggest alteration you can have made to some pants, but it can often be money well spent. It pretty much involves unpicking all of your trousers and recutting the separate parts they’re made from so the new pants deliver the fit and style you want. This may mean taking in or letting out the waist, tapering the legs, changing the rise of your pants (the distance between the middle of the crotch seam to the top of the waistband) and replacing pockets. It is a lot of work, but it still may be more cost effective than getting some new custom made pants created for you. As always, the best thing to do is visit our store with your trousers and speak to our style consultants or tailors about what you’d like. Certainly one of the best alteration investments you can make is to have an off-the-peg suit jacket taken in or let out so it looks like it was tailor made for you. Sometimes the adjustment can be less than an inch, but the difference it makes can be massive. It really can transform a $300 suit into one that looks like it’s worth over $1,000. Taking in a jacket so it creates a great silhouette around the waist and chest is a fairly straightforward procedure once we’ve taken a series of precise measurements from around your body and discussed the fit you want. Letting out a jacket is more difficult, because it all depends on how much fabric is available to increase the size of your garment. At HKT, we can shorten a jacket that looks too long on your body. But we recommend that you don’t go beyond an inch. That’s because the overall balance of your jacket will be compromised, as the spacing of your pockets and button holes cannot be altered as well. It’s also impossible for us to lengthen a jacket. So if you are looking for a new off-the-peg blazer, always make sure it’s not too short. And ideally, the length of your jacket should be approximately half the distance from the base of your neck to the ground, eg if the measure from the base of your neck to the ground is 160cm, the length of your jacket should be around 80cm. When it comes to jacket sleeves, you want them to finish around ½” to ¾” before the end of your shirt sleeves. With off-the-peg suit jackets, this doesn’t always happen, which makes this alteration very popular with a lot of our clients. Ninety-nine times out of 100, this involves our tailors shortening sleeves to produce the suave look that’s wanted. However, if there’s enough fabric under the cuff at the top of your jacket sleeve, there is the possibility that your jacket could be lengthened a little to get the ideal fit. Sometimes our clients find a jacket that fits them perfectly apart from the arms, which are typically too wide. If this is an issue you’re facing, please get in touch with us. We can assess your jacket and let you know how much we can slim down or taper the sleeves to give them a far more stylish look. With regards to widening sleeves, this all depends again on how much fabric there is to work with. If this is a problem you often face, maybe because you have muscular arms, you might want to think about buying jackets that are a size up so they fit better on the arms and then have the jacket taken in. Typically, the first thing you’ll notice when you try on a suit jacket is whether it fits you well on the shoulders. If it doesn’t, then it’s usually not worth purchasing the garment. However, you may have bought a suit jacket that fitted well in the past but over time the shape of your shoulders and chest have changed (usually because of muscle growth). Alternatively, you may have inherited a jacket that you desperately want to wear but which doesn’t sit well on your shoulders. If you fall into either of these categories, our expert craftsmen can help. Successfully reshaping shoulders (and often collars as a consequence) is major surgery, but without doubt we can do it. We can extend or reduce the shoulders of your jacket, and correct the collar, so your jacket begins to look more bespoke and provides excellent comfort when you wear it. Jibin’s brown off-the-peg suit was made from a great material but it had a lot of issues that are commonly experienced when a suit not made to measure. The trousers were far too long and baggy, creating a terrible break above his shoes and an overall sloppy look. On top of this, the length and width of the sleeves of his suit jacket were too big, and there was a lack of a sharpness around the chest and waist because of excess material. Overall, Jibin wasn’t hitting any sartorial heights and looked completely swamped by his suit. With Jibin’s suit pants, we took up the hem so they finished exactly at the length he wanted. We also tapered the trousers all the way down the leg to create a more streamline, flattering cut that looks right up to date. On top of this, we shortened the length of the jacket’s arms so they fall perfectly on the wrist; and if Jibin wears a shirt with his jacket, you’ll see approximately ½” of the cuff of his shirt sleeve. Maybe most importantly of all, we took the suit jacket in around the waist and chest to make it much more fitted. The end result is a closely fitted suit that looks bespoke and far more expensive than the suit’s original price tag plus the cost of the alterations. Contrast the suit’s silhouette in the first photograph with the sleek, modern silhouette in the second and it should be obvious why investing in alterations is definitely worth the money. 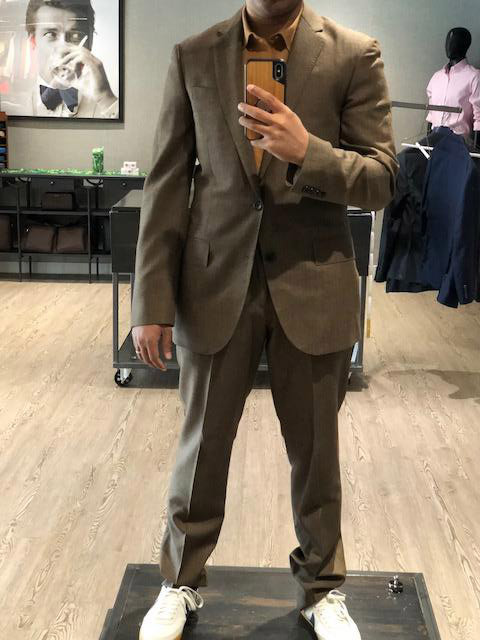 Jibin also told us that the suit felt fantastic to wear, and that it looked great matched with a T-shirt or dress shirt, as well as loafers, sneakers or more formal shoes. At HKT, we’re also really proud of the result, because it’s always a great feeling to turn a $300 suit into a $1,000 one. Do you have an old suit you never wear or a new suit that needs altering? At HKT, we can alter any suit, no matter if you bought it from us, another suit maker or the high street. 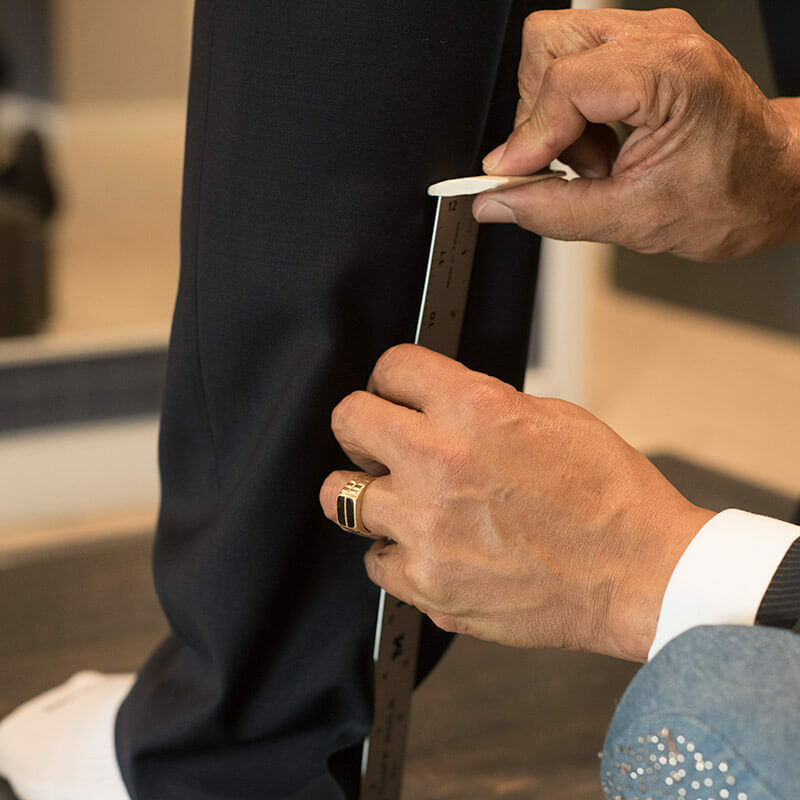 Simply book an appointment with one of our expert tailoring consultants by calling us on 770-458-8682, emailing service@hktclothiers.com, or using our online booking form. When you come in-store with your suit, we’ll be able to advise you on the best way to update your suit so you get the fit and style you want. We truly believe that you’ll be amazed how our master tailors can breathe new life into an old suit and modify a new one so it looks custom made for you.